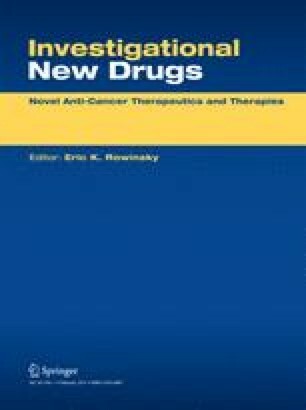 From February, 2001 to September, 2002, the Southwest Oncology Group (SWOG) accrued 65 patients with advanced gastric adenocarcinoma to a phase II trial of weekly 5-FU, leucovorin, and the orally-administered uridine analog PN401. Of these 65 patients, 57 were assessable for survival and toxicity, which were the endpoints for the study. Treatment consisted of the administration of 1200 mg/m2 of 5-FU, 500 mg/m2 of leucovorin, and 6 grams of PN401 every 8 h, beginning 8 h after the completion of the 5-FU infusion, and continuing for a total of 8 doses (48 grams) during each weekly chemotherapy session. Therapy was delivered for six weeks out of every 8-week treatment cycle. The gastrointestinal toxicity of this regimen was mild with 2 patients experiencing grade 3 stomatitis, and 6 patients having grade 3 diarrhea; and the hematologic toxicity was acceptable with 6 of 57 patients found to have had grade 3 or 4 leukopenia, and 14 of 57 patients experiencing grade 3 or 4 neutropenia. There were two deaths judged possibly related to treatment; one in a patient who experienced a variety of Grade 2 gastrointestinal toxicities and died at home with an unknown cause of death; and a second patient who also died at home, and for whom treatment-related sepsis could not be ruled out. The overall median survival was 7.2 months. The ability to safely deliver twice the usual dose of 5-FU with leucovorin on a weekly schedule suggests that oral uridine analog supplementation with PN401 may enhance the therapeutic index of the fluoropyrimidines.